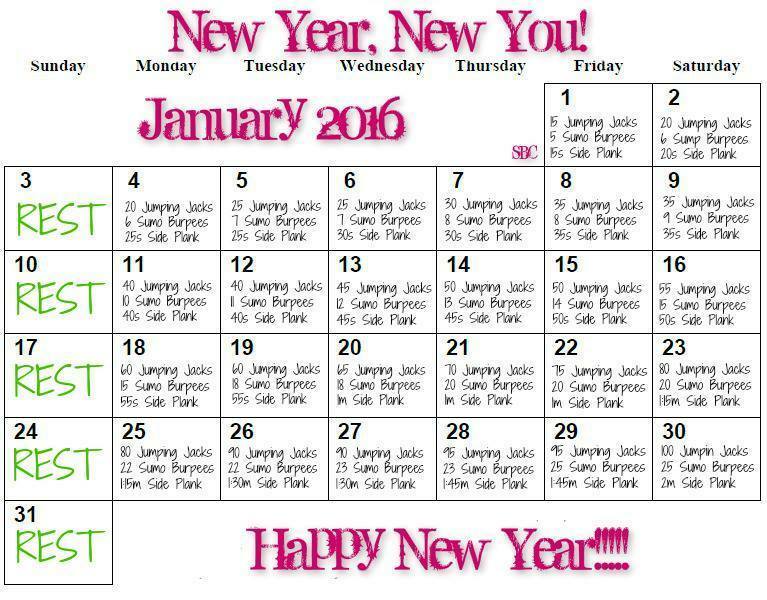 This January 2016 we are exercising daily and doing a no junk food challenge. Don't worry if you missed getting started on 1st because you can jump in any day that is best for you (the sooner the better). The holidays are over, so we need to get back on track with our weight loss goals. Join our Weight Loss Support Group if you're with us, so you can check in, too! 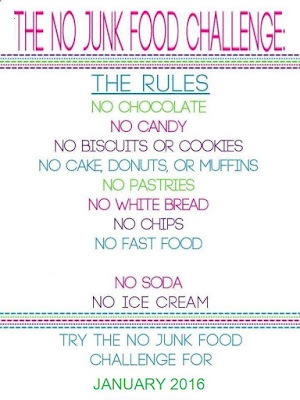 The goal of the No Junk Food Challenge is to cut the processed refined sugars from your diet. You will eat NO JUNK FOOD and NO WHITE BREAD for the month of January 2016, and hopefully forever by replacing your favorite "junk" with healthy substitutions that you can stick to (I will post some of these soon!). This is a great way to cleanse your body from all of the junk you ate over the holidays and get back on a healthy track. This food change can help kick start your 1 to 2 pounds a week weight loss (or more). --- Wouldn't that be awesome! 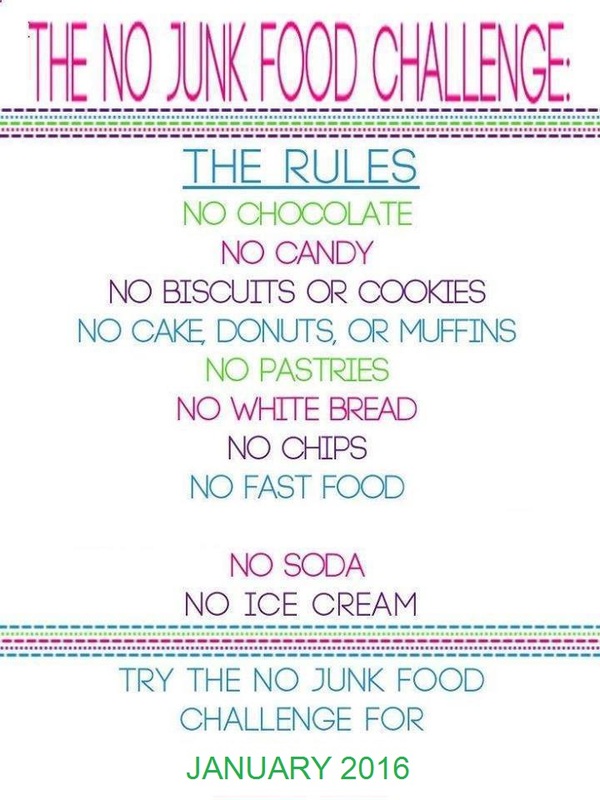 NOTE: You can take this No Junk Food Challenge even further by giving up white rice and noodles, too!!! CLICK HERE to print and put on your fridge! How can I give up junk food, white bread and even the rice / noodles? Do the best you can and take it one day at a time as not to overwhelm yourself. Just get all the junk out of your house; buy, cook and eat whole foods! Ask your family for support! They can do the challenge with you or at least agree to eat their junk food out of the house and far away from you while you are making this major effort. CLICK HERE to print this calendar as a guide! Here's the deal ... Do what you can from this list. If you can't jump, then either do a modified jumping jack or skip the jumping jacks and burpees; just do the planks each day and take a walk. If you can't side plank then do a regular or modified plank. Do give yourself any excuse not to exercise with us each day even if you need to do chair exercises as your challenge instead. The goal is to plug in and exercise with all of us each day, so that you can become more strong, toned, energetic and feel great! Exercise helps us with weight loss and mobility as we age, too. So, please make sure to print, bookmark or share this page, so that you have this info when you work out. Here's to your happiness and health!! !